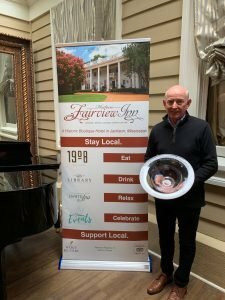 Jackson, MS – Peter Sharp, Owner of the Fairview Inn, has just been awarded the 2019 Voice of Innkeeping Award by the Association of Independent Hospitality Professionals (AIHP). AHIP represents over 14,000 Inns and Bed and Breakfasts throughout the United States and Canada. The award is given to an individual in recognition of long lasting contributions to the Innkeeping Industry. They must demonstrate excellence in Innkeeping and in Industry leadership on a national and regional level. Sharp was on the Board of the Bed and Breakfast Association of Mississippi for six years and President from 2008 to 2011. He is also served on the Board of the Mississippi Tourism Association, the Professional Association of Innkeeper’s International (PAII), Select Registry ( A collection of 400 national Inns) and Beth Israel Congregation here in Jackson. He is a founding member of AIHP. Sharp has operated the Four Diamond, Fairview Inn, along with his wife Tamar since 2006. The Fairview Inn is an eighteen room, boutique luxury Inn in the Belhaven neighborhood of Jackson, MS. Along with lodging, the Inn has 1908 Provisions Restaurant for dining, the Library Lounge for cocktails and appetizers, Nomispa for relaxation, and provides event service for rehearsal dinners, weddings and receptions, along with Corporate and Social gatherings. For more information go www.fairviewinn.com or call 601-948-3429. Belhaven Heights Park Beautification Project Art for the Park 2019 is set for Thursday, April 25!